The purpose of this probe is to elicit students’ ideas about the day/night cycle. The probe is designed to find out if students recognize that the Earth’s rotation is responsible for the day/night cycle. In this chapter, students will explore the day/night cycle. The probe asks students to determine why we have darkness at night and asks them to explain the "rule" or reason they used to determine their answer. The chapter includes teacher notes and breaks expected prior knowledge down into elementary, middle school and high school levels. 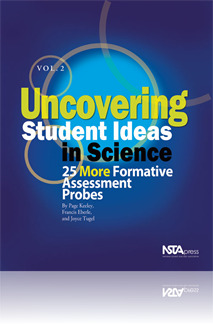 It details how to administer the probe, related research, suggestions for instruction and related NSTA publications and journal articles. This is an excellent probe that will help identify and correct student misconceptions about the day/night cycle. Seeminly simple questions can elicit a great deal of information about what students are thinking. Asking students why it is dark at night can provide information for a teacher to use to design their instruction. The chapter provides background information, information about alternative conceptions students may have, and possible implications into teaching.